Through The Fire is one woman's experience in surviving domestic violence. Harriet Cammock thought she met the man of her dreams when she met Sam, while working as a receptionist. He swept her off her feet and before long, they were married, even though from that day, she knew things were going to go horribly wrong. Even though her friends AND her family warned her not to marry this man, there was something about him that didn't set right with any of them, plus, there were the rumours of all the other women he had been neglectful towards. At first, things seem okay, even though Sam HAD to be in control of every aspect of their Honeymoon, and they didn't even end up having one. Sam would be gone for months and months at a time, leaving Harriet to find herself. During the next few years, Sam alienates Harriet from everyone she has ever known, monitors all her calls, drives her to wherever she needs to go and basically becomes her warden. When Harriet has her daughter, things get even worse, as Sam begins to build a wedge between mother and daughter. However, that all backfires on Sam, as Alexandra emerges as a wise and courageous little girl, standing up to the abuse of her father, even being threatened with a knife, while her mother does nothing to defend them. After several attempts at leaving him, only to return to the madness, Harriet finally finds the strength to stand on her own and walks away from her journey through hell. I'm not sure what to make of this book, while I commend the courage it took to write it, I found it disjointed and hither tither in thought recollection. The mincing of words bothered me, if he swore, then swear, having the words blanked out as they were was not very professional. And I was confused with a balled up fist and a slap...I'm not sure how one can ball up their fist and slap a person, it sounded to me, like a punch and if it was a punch, then say that. I found Alexandra most courageous and I couldn't help but thinking she is the real champion in this story. However, if my little girl every spoke to me in such wisdom and at such a tender age, it would break my heart and once I had escaped, there would be no turning back! I'm not sure what Harriett was thinking when she escaped the first time and holed her and her daughter up at Sam's childhood friends house! Why didn't she call her family then and have them come get them? Why didn't Harriet use all the resources at her fingertips and take her own citizenship into her own hands? I don't understand why she set herself up to be the victim at every turn when she had venues for escape. If you've been abused, you may find something in this, such as Harriett's tenacity when she finally does escape, to remain free. Her final determination and will power was admirable. 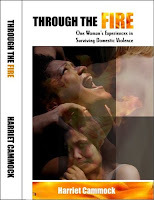 In Through The Fire, Harriet Cammock has written a captivating account of surviving domestic violence. Having lived countless years in an environment of verbal and physical abuse, Harriet recollects events no person ought to be able to call to mind. Vivid accounts create unease, knowing people are able to harm each other on such levels and call it love. Harriet shares her blinded love, innocent assumptions, dreaded encounters, and fear-driven hopes, as she recaptures the essence of her painful memories. We journey with her through dating a perceived white knight; coping in a hopeless marriage; raising a child matured, too early, through unfathomable pain; and surviving near-fatal encounters with a madman. Harriet exposes the reader to an abuser’s enchanting personality as he unfolds to reveal heinous acts, detrimentally affecting the surrounding families, friends, extended networks, and self.